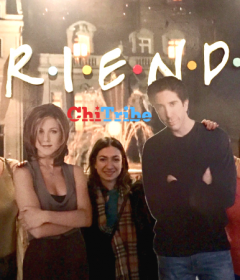 Meet Actor Meg Grunewald: The Bubbe on the Right! 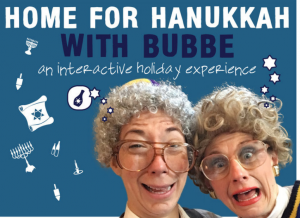 We were so excited to chat with Meg Grunewald about her new project, Home for Hanukkah with Bubbe: An Interactive Holiday Experience. 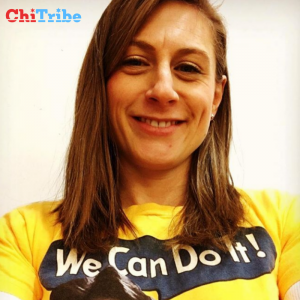 Read about her formative years growing up in Chicago, her experiences at camp and her tips of where to laugh in Chicago – enjoy! Chicago!! I grew up in Chicago and went to Bell Elementary and then Lincoln Park High School. I grew up going to my cousins house to celebrate Chanukah but never belonged to a congregation. In third grade, I asked my mom if I could go to Sunday school (I know…the only person to ever ask to go to Sunday school). After some classic “Synagogue Shopping,” we ended up choosing Temple Sholom, a reform congregation in East Lakeview, and I was introduced to OSRUI, a URJ camp. I was also very involved in NFTY, the reform youth movement, and served as president of NFTY CAR my senior year of high school. I graduated from Scripps College in Claremont, California. Majored in Theatre. Interesting OSRUI/college connection: my best camp friend, since age 11, was going to Claremont McKenna at the the time and I went to visit her and decided to apply to the sister school, Scripps College. I would have never went there if it hadn’t been for my camp friend, Sam. I do many things! I am an actor and comedian by trade but also a “fun facilitator.” I perform at ComedySportz, as well as Laugh at Loud, regularly. I also work in print advertising and commercials as a kid wrangler on set. Basically, I am the person on the other side with the photographer making the kids laugh. Additionally, I use my improv skills for communication workshops and trainings for SP (standardized patient) work at University of Illinois – Chicago. As an SP, I assist medical students by portraying different medical cases in order for them to cultivate their bedside manner and over-all “doctor-ing” in a safe learning environment. AND fun facilitation! I host at Game Night Out at Landmark/Century on Clark. I would say it is the best game night because you don’t have to host or clean up! I also work at AceBounce and Flight Club, both on Clark and Wacker. During the holidays, I go to Mishkan and I preach this organization to everyone I know. I do Passover with my family. I staffed Ta’am Yisrael in 2015 (the Chicago area eighth grade trip to Israel). Last year, I taught at Anshe Emet. And this show! In your opinion, what is the greatest hidden comedy gem in Chicago? The Paper Machete at the Green Mill on Saturdays from 3:00-5:00 pm. It is by far the best free show in this city. It is weekly so it stays current and is like a live magazine. They have comedians and bands, character bits, and I always see something new and original. Truly, the smartest stuff you will see in this city. A “not theatre” theatre experience. You have to get there by 2:00 pm to get a seat! I consider myself a comedian who is Jewish. Judaism is definitely a filter that I see things through, but I probably wouldn’t bring down the house at a Yeshiva. If an audience expects me to do Jewish humor and bits, I can most definitely deliver, but it is not really what I generally talk about. Except for this show! In this show, I am a Jewish comedian. Tell us more about the creation of Home for the Holidays. I created the show in 2016 because I was concerned that people did not understand what it means to be Jewish; they think Hanukkah is the Jewish Christmas. I think there is no a way better way to experience and teach Hanukkah than in a fun comedic way. Throughout this “scripted improv” production, I try to educate the audience about the actual holiday. People leave the show laughing and having learned a lot more about Hanukkah. We also ask local businesses to sponsor food for the show because it helps get their brand more visibility and teaches another lesson- that to truly create a sweet Hanukkah memory- there has to be food. What is your favorite Food spot in Chicago? Who do you want to shoutout? My old camper Solly Kane who is now the Director of Camp OSRUI! 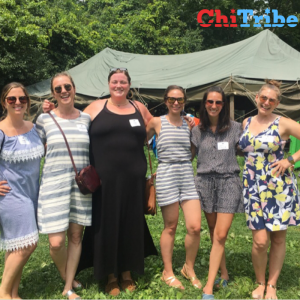 Now finish this statement, When the tribe gathers …They can be a lot of fun! 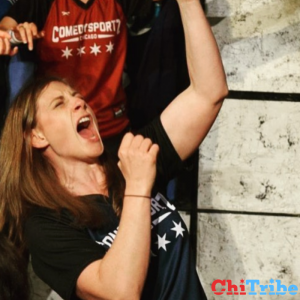 Don’t miss out on this hilarious Chicago comedy Hanukkah classic. 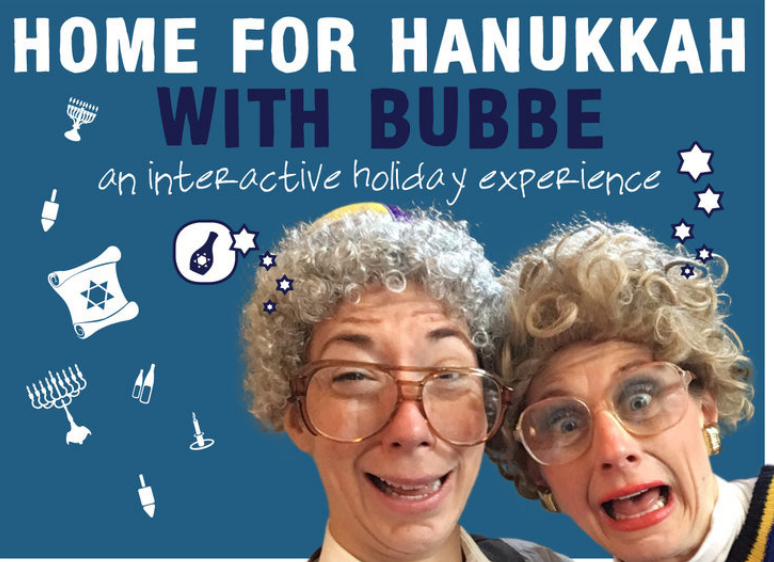 Bubbe and Zayde are having a Hanukkah open house, along with their family and special visits from friends, featuring stories, songs and good old fashioned schmaltz! Come share the laughs and maybe a few latkes. 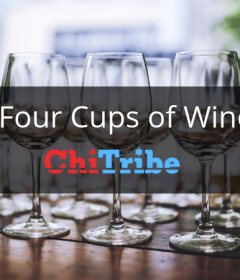 Find more events like this on ChiTribe’s Event Calendar.